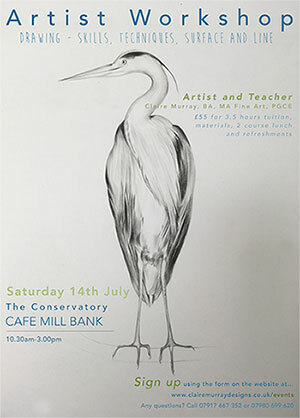 Café Mill Bank is proud to host Claire Murray’s drawing workshop on Saturday 14 July 2018. The workshop will cost £55 which includes tuition, materials, refreshments and a 2-course lunch. The workshop is open to all abilities, whether you are an experienced artist or novice beginner, and teaching will be differentiated to accommodate all levels. There will also be a raffle on the day with an opportunity to win a signed print of one of Claire’s paintings!